CAT: Why don’t we drop the defensive shields? 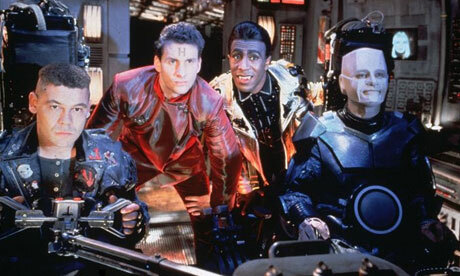 KRYTEN: A superlative suggestion, sir, with just two minor flaws. One, we don’t have any defensive shields, and two, we don’t have any defensive shields. Now I realise that, technically speaking, that’s only one flaw but I thought it was such a big one it was worth mentioning twice. I am reminded of Kryten’s words whenever I see the No campaign’s figure repeated anywhere. I’ll explain why below. Take another look at the Electoral Commission’s comment; at this stage it hasn’t even considered if electronic voting machines are necessary – let alone looked at the potential cost. Whether voting machines are bought are not is a separate debate that is unrelated to which voting system we use. They could also be introduced if there’s a no vote and we keep FPTP. Danny Alexander, the Lib Dem Chief Secretary to the Treasury, has denied the claims that a move to AV, under which voters rank candidates in order of preference, would force Whitehall departments to make more painful savings. In a letter from his private office, Mr Alexander insists: “The Government has no plans to reopen departmental spending review settlements as a consequence of a Yes vote in the referendum on AV.” He also confirms that £120m has already been set aside for the next general election, to come from the Cabinet Office budget, and reveals that the Treasury “has not received any advice on the assumptions behind the cost of the next general election should it be an AV election”. The cost of the 2010 General Election, as far as I can gather from this written answer from Francis Maude, was £102m. A rise of £18m in five years, after allowing for inflation, seems about the same figure in real terms. Ah, you might say, but Danny Alexander is a Lib Dem, and in favour of AV. No wonder he’s quickly come out and rubbished No2AV’s claim. Surely a vote for AV will mean there is less money to spend on health services, maternity units and the like? As Kryten might have said, there are really only two problems with saying that voting Yes2AV will cost £250m. Firstly, it won’t cost £250m. And secondly, it won’t cost £250m. It might only techically be one reason, but it seems like such a big one that it’s worth mentioning twice. This entry was posted in Politics and tagged AV, AV Referendum, Danny Alexander, No2AV, Yes2AV. Bookmark the permalink.